RoundHouse is one back from ocean! Climb up to the roof deck and enjoy sweeping views of all of Fire Island and the bay. Enjoy views when eating dinner and hanging out on the main level. 3 bedroom 1.5 bath with out door shower. Floor 2: Kitchen, Dinning room, bathroom, living room its a open floor plan with 360 degree views. deck allows you to walk around the house and enjoy a coffee or lunch with a view that cant be beat! Floor 3: Rooftop is full outline of the house this deck is over 550 square feet of views of long island, great south bay, Fire island light house. Nothing like it on fire island! Everything you need for 3 nights or a month is available in the house. I m a resident of bay shore my family is a long time Fire Island native. We bought the house back in the 70's. Over the years my kids and grandkids enjoy the house when it is not rented. When we frist looked to buy a house in the 70s this house caught are eye as it is one of a kind. The views from the main level are outstanding and breath taking. Have you ever stayed in a roundhouse?? owner is not responsible for safety of riders. We loved staying here; the views from the second floor & roof are gorgeous. Beds very comfy! A unique property steps from the beach. Just got back from this house with my family. We had such a great time! Loved the house...especially the roof top deck. The views were amazing and it was just steps from the beach. My family left with wonderful memories that will last a lifetime! This house is the perfect fire island house. We couldn't have been happier. Close to the ferry and right on the beach, this house was the perfect getaway with a group of 8 friends. Would highly recommend and hope to stay here again! 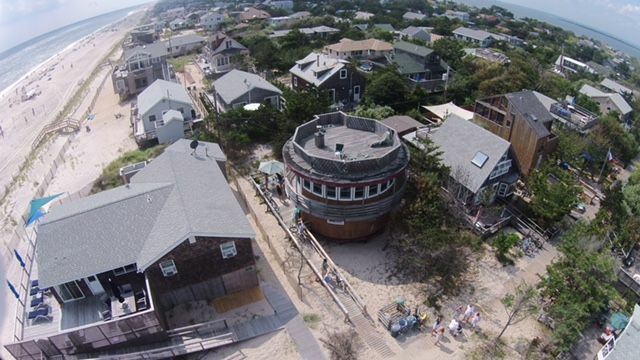 The roundhouse views are unbeatable, and only STEPS from the beach which is very convenient. 6 girls including myself stayed comfortably in the three bedrooms. We did spend a lot of time on the awesome rooftop enjoying the views and the sunrise/sunsets. Owner was available for questions and recommendations during our stay. Not sure if there was a wagon available for use, but it definitely would have made it that much more convenient since it's a little less than a 1/2 mile walk. All the girls are all ready to book again and go back to the round house!